Critically low number of spawners well below minimum spawning targets. Due to low marine survival of 1sw grilse in particular. Habitat degradation in areas of commercial forestry and Smelter intake dams. Wild Lochy smolts grown on to produce captive broodstock. Eyed ova from these broodfish planted in artificial redds in all tributaries in late winter. Live discussions with new owners of smelter and Forestry interests to improve flows and riparian habitat in Lundy and Cour tributaries. High seas (ocean migration and marine phase from West Coast to North Norwegian Sea and East of Faroes). The continued decline of 1sw grilse and can we do anything in response? It cannot have escaped anyone’s attention that summer and autumn grilse numbers have been in steep decline across the whole of Scotland for several years now. The West Coast rivers, being primarily grilse fisheries, are being particularly badly affected. There will be a range of reasons for the decline – many most likely the result of global climate change (perhaps cyclical, perhaps not) – but one of these is likely to be the rapidly expanding pelagic fish stock throughout the whole of the salmon’s 2000 mile journey in the North East Atlantic. It would appear that mackerel in particular have mushroomed in number and spread over the last 5 years or so and present a very stark competitive and predation risk to small surface-swimming salmon smolts in their first year at sea. It would also seem that if the smolts can survive this dense proliferation of predatory competition then the pelagic fish themselves become their prey – hence possibly why we see the early MSW salmon in such great condition when they return from the sea, albeit the fewer numbers that survive the competition in their first year at sea. At the moment the pelagic predation and competition threat is a hypothesis (see link below for the summary paper) but we are compelled by the seeming evidence at ‘river level’ and we are working closely with its author (the leading marine biologist and pelagic/salmon expert Jens Christian Holst) to try and facilitate international cooperation to facilitate further research into this field. As a key part of Dr Holst’s hypothesis suggests that the relevant authorities are using outdated models to assess the pelagic stock and set the fishing quotas for these species, the end goal of the research (should the hypothesis be shown unequivocally to be based on fact) will be to attain much much larger quotas for fishing vessels to harvest mackerel in the NE Atlantic. This may also include a ‘safe passage’ corridor along the known path of migrating salmon smolts on the ocean conveyor belt on the continental shelf edge west of Hebrides all the way up to the feeding grounds in the Norwegian Sea. The threat of salmon by-catch by pelagic trawlers remains very real but it seems likely that the ecosystem-sized problem of mackerel competition probably dwarfs the potential numbers involved in anthropomorphic by-catch (the AST are currently undertaking a project using eDNA to try and put a number on the by-catch issue which should report at the end of the year). Meanwhile there will be a host of other factors, both in freshwater and the sea, that will be impacting salmon numbers. We are closely involved with the Atlantic Salmon Trust’s new ‘Likely Suspects’ project that will be attempting to put some numbers on these factors both in a local and national context. These figures will hopefully then inform where action and resources can be most effectively delivered. 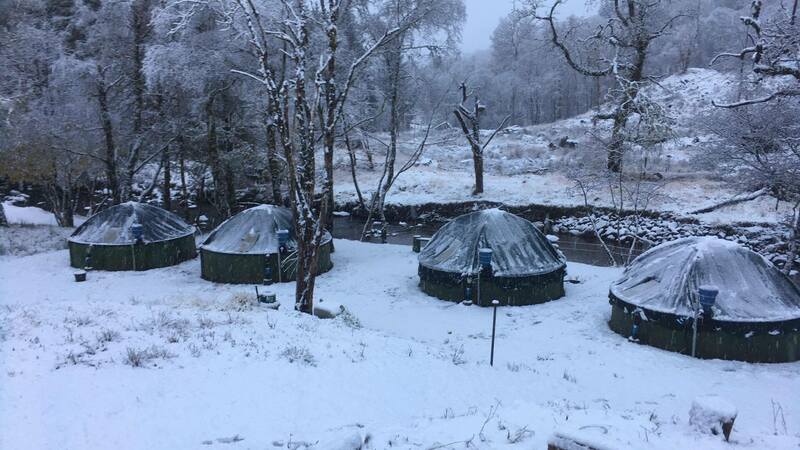 In the case of the Lochy such factors will inevitably include hydro dams, winter floods, bird and seal predation, forestry and fish farms. All of these areas are being addressed on a constant basis through close stakeholder dialogue and practical action, but it will help to perhaps be able to put some of these risks into an overall relative context and where we need to concentrate our efforts. Meanwhile on the ground we are making sure we have a very clear picture of how the freshwater phase of the Lochy salmon’s life cycle is performing – A very detailed habitat survey of all spawning and juvenile habitat in the entire catchment, including all the main stems of the Lochy/Spean/Roy and Arkaig and all their tributaries, gives us a very clear idea of how many spawning salmon is takes to fill each area of the catchment. Obviously with these drastic falling numbers of returning grilse some of these spawning targets are not now being met. Generally speaking the higher catchment is performing better than lower down in the system, which is what one would expect when the bulk of the run appears in the spring and early summer. An annual electro fishing survey allows us to put numbers on this and shows us where the main gaps are in the catchment. Using these data we are able to respond using our hatchery and reseed barren areas of juvenile habitat with summer fry. Furthermore, due to the extensive facilities and skill base at the hatchery, we are also able to safeguard the future juvenile populations by growing indigenous captive broodstock in the hatchery for each area of the catchment and then releasing eyed ova from these broodstocks into redds in the gravel each winter (in streams where no redds were counted the previous winter). 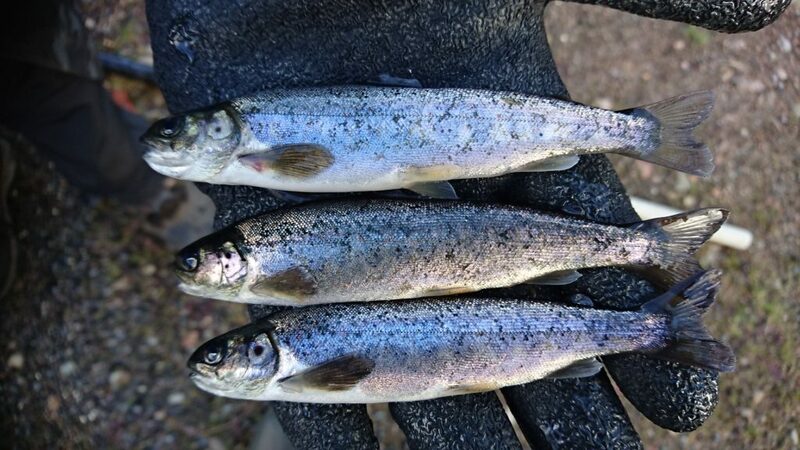 There is little doubt though that the recent declines seen in returning salmon and grilse to the Lochy lies primarily in their marine phase and we see the job of organisations such as the Atlantic Salmon Trust as critical to the future of the species. Meanwhile all we can do at a local level is maximise the healthy output of the river (which is essentially just a ‘smolt factory’) through habitat improvement and protection, controlled adult exploitation and targeted restocking to allow each river and tributary to reach its juvenile carrying potential. Jon Gibb, River Lochy Association. 12th August 2018. This is a fabulous new film about the full life-cycle of the Atlantic Salmon. Well worth watching to see all of the threats this amazing fish must overcome to complete its ultimate journey – to spawn back in the river of its birth. I hope you enjoy it much as I did. A cold and busy winter over as a new season starts..
It’s been a busy last few months at the hatchery and in our representational work at a national level. Nevertheless we successfully grew on all of the eyed ova required for outside contract work (currently the Ness DSFB project to restore the Upper Garry is the largest of these) as well as growing on all of the Lochy eggs with near 98% survival through to alevin. The first of the alevins are now only now just beginning to absorb their yolk sacs and they will be introduced to feed over the next few weeks. 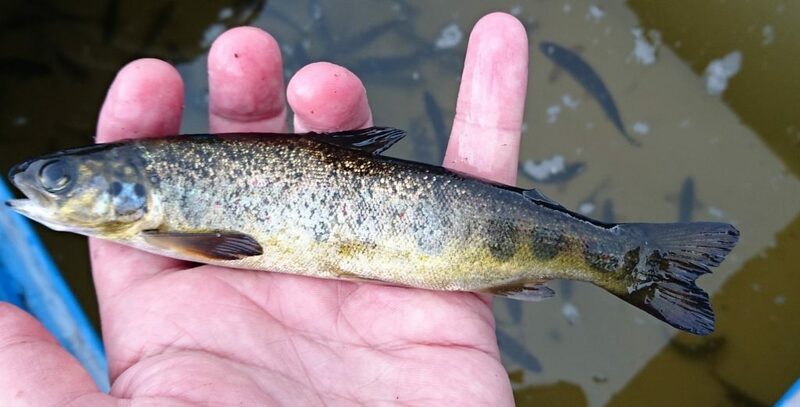 These fish will be stocked as fed fry based on an electro-fishing survey being undertaken in July to identify poorly populated areas of the catchment. Meanwhile stocking of fin clipped smolts was undertaken in April and early May. 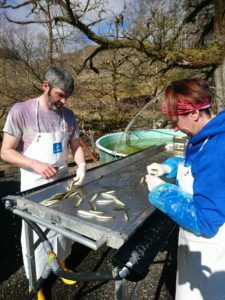 15,000 fin clipped smolts were released in the Roy and 50,000 fin clipped smolts were released in the main stem River Lochy. 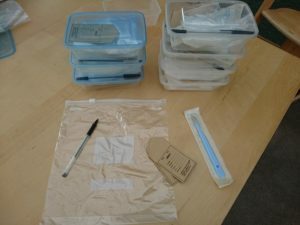 The latter fish were treated with the infeed anti-sealice medicine SLICE which should give them 6 weeks protection from infestation as they find their way out to sea. Probably the most important event of the last few months for us has been the Scottish Government’s enquiry into salmon farming. This is due to report some time this summer. 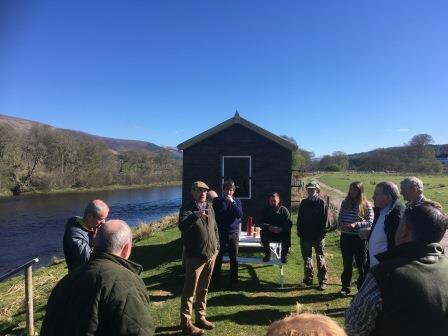 We have made sure that the Lochy and surrounding rivers have been at the forefront of their considerations and, as well as written representations, I was invited to give evidence as a witness to the Committee as part of their enquiry. Following this I hosted a site visit for the REC Committee to the River Lochy and Drimsallie Hatchery. These were both very good opportunities to express the view that, while we view fish farming as critically important to the West Coast economy, we do not believe that it is currently being undertaken in suitable locations or that regulation is tight enough to protect migratory fish. So we now all wait to see whether the MSP’s will be brave enough to tackle the problem head on and introduce new measures to see the genuinely sustainable expansion of the fish farming industry. So as a new season starts we all wait to see what it will bring. Will the spring and early summer run continue the trend of recent years (2017 aside) and continue to increase? Or will the summer and autumn grilse runs improve on recent years? We won’t know unless we are out there with a fly in the water.. so I wish all visiting and local anglers Tight Lines for the season ahead…..and don’t forget to check for those adipose fin clips! 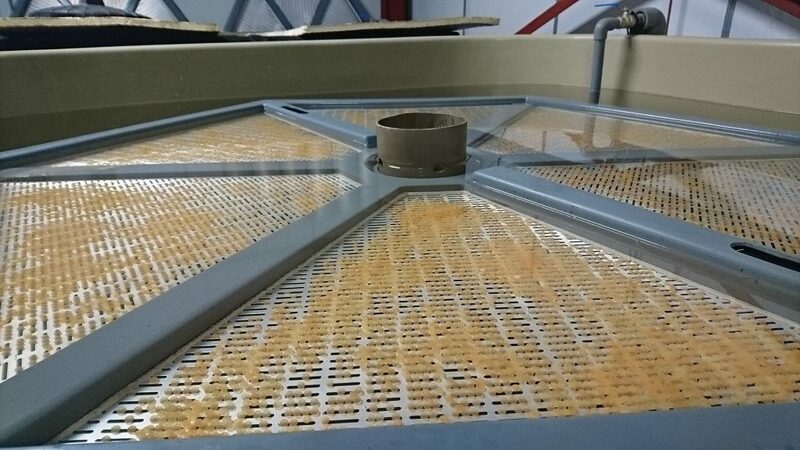 Jon Gibb, Hatchery and Restoration Manager. Just about all of the fisheries management world is now agreed that we are currently entering a MSW salmon cycle and are fast coming out of a 1SW grilse cycle. If history repeats itself, it may last up to 60 years! We are at a pinch-point in that transition and all it takes in any given year is for a poor MSW salmon run (as happens frequently, even in normal times) and the whole season collapses, as the salmon component of any annual run in a river is always far less numerous than grilse. I suggest this is probably exactly what we saw in rivers such as the Awe and the Lochy in 2017. The reason for this grilse to salmon shift appears to be a warming sea (especially in the western edge of the NE Atlantic) and the complex changes it is having on (parts) of the ocean. Some areas of the NE Atlantic are still fairly stable, probably due to lesser impacts from shifting warmer currents (there is a known ‘cold blob’ just west of Norway for instance) but in other areas the lack of ‘grilse sized’ food is catastrophic: West of UK and South of Iceland being 2 examples. This is probably the reason for the northern Scottish rivers holding up particularly well and the southern and western rivers on the point of collapse in some cases. In times of grilse abundance (1960’s to 1990’s) the much cooler ocean would have held food uniformly all over – nowadays the food supply (and temperature) is highly patchy. Sand-eel numbers have spiralled downwards due in part to the explosion in numbers and the unprecedented geographic spread of mackerel and other pelagic fish as waters have warmed. Grilse require abundant sand-seels to grow strong enough to survive their first winter at sea. A post-smolt salmon is a relatively rare creature in the vast ocean and the competition from any super-abundance of any marine species such as mackerel will completely swamp the vulnerable post smolt’s ability to compete for the same food source. Anyway, all of the above is having an equal impact of sand-eel eating seabirds such as kittiwakes (doing very badly) but is favouring deep diving fish eaters such as gannets (doing very well). I cannot recommend highly enough the following programme which explains all of these oceanic changes on seabirds (and salmon) far better than I can. The mechanisms at play for both species are exactly the same. Another terrible decision by Highland Council! 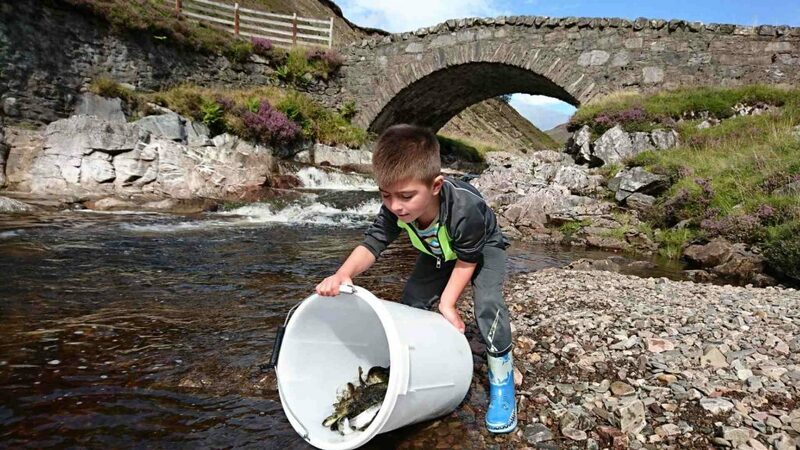 50,000 Spring stocked fin clipped smolts main stem River Lochy April 2017 25,000 Late autumn parr stocked into Roy Catchment One of our young helpers! One of our young helpers! Please note that ALL FIN CLIPPED FISH MUST BE KILLED IN 2016. 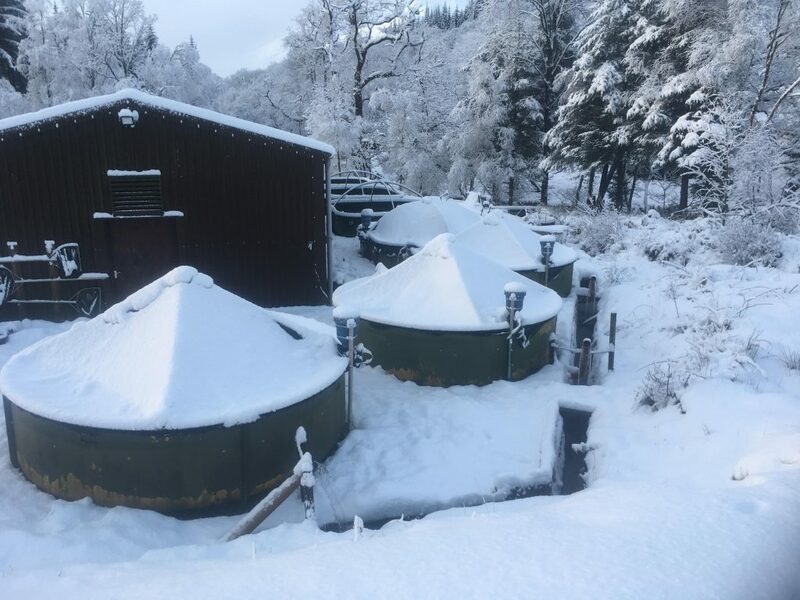 As part of a Marine Scotland study into the fecundity of returned hatchery fish on the Lochy, all of the ghillies will be carrying equipment to extract and store the ovaries of all hen fin clipped salmon and grilse and take scale samples of all fish. All fin clipped fish caught on the club beats should be reported immediately to the River Manager. That's the last of the smolts fin clipped this year - many thanks to Kathy and Barry at Aqualife for helping out. That’s the last of the smolts fin clipped this year – many thanks to Kathy and Barry at Aqualife for helping out. New Conservation Measures. Science or fantasy?